AMERICAN HUSTLE is based very loosely on the FBI ABSCAM sting operation that, back in 1978, took down 6 members of congress and a Senator, not to mention a few smaller fish. The bureau did this in part by utilizing the services of a convicted con artist who helped create a convincing set-up involving a phony middle eastern sheikh. That much, at least, does make it into the film. But there's a reason AMERICAN HUSTLE begins with the onscreen disclaimer, “some of this actually happened” rather than the usual “based on a true story”. Not only have names been changed, but characters and situations have been invented, and director David O. Russell intentionally rewrote Eric Warren Singer's screenplay to make it more comedic. The costumes, hair, and make-up further push the film into camp territory, with the amped up performances by just about everyone in the cast pushing the movie completely over the top. As conman Irving Rosenfeld, a shabby, pot-bellied Bale sports a ludicrous comb-over, improvising his way through the film and chewing scenery like a rabid wolverine. Bale's co-stars prove just as capable of cranking it up to eleven. Amy Adams (as Rosenfeld's mistress and partner in the con, Sydney) and Jennifer Lawrence (as Rosenfeld's wife, Rosalyn) parade about in one tacky seventies outfit after another, most of which invariably spotlight their cleavage. Adams does a cheesy British accent as part of her character's con, while Lawrence seems to be trying out for a spot on Real Housewives of New Jersey. Although having to make do with slightly less impressive bad hair than Bale, Bradley Cooper (as FBI agent Richie DiMaso) sports a horrendous curler doo and throws beatdowns on his mild mannered boss (played by Louis C.K. ), while Jeremy Renner (as fictional New Jersey mayor Carmine Polito) stays remarkably calm given that he has some sort of woodland creature on top of his head throughout the film. Russell orchestrates it all like the big, Oscar hopeful epic it clearly wants to be, trying to blend his comic sensibilities with unabashed Scorcese worship. The soundtrack blares predictable rock and disco tunes that rarely serve the action in any way other than to remind us, “hey, it's the seventies.” And don't worry about having to figure out what the themes are – they're stated clearly and directly by the characters: People believe what they want to believe. Everyone is a con. We con ourselves as much as anyone else. Sooner or later we have to stop conning ourselves and get real. 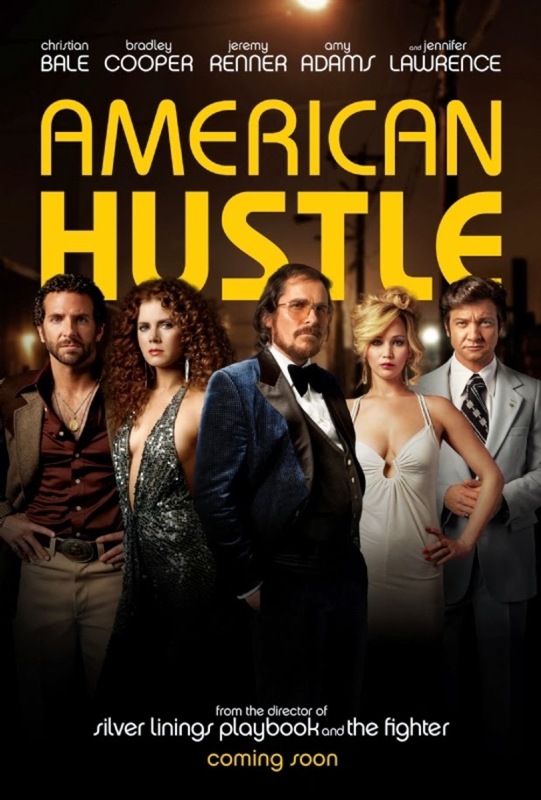 No, subtlety isn't the order of the day here, but that doesn't stop AMERICAN HUSTLE from being a rollicking fun movie. It's so much fun, in fact, that while you're watching, it really doesn't matter how shallow or silly the film is. At the risk of getting too cutesy, you could say the movie cons the audience. Which, after all, is what good movies do, isn't it? If you're having too much fun to notice the plot holes or gaffes, or the fact that the movie isn't really about much of substance, it's doing its job. And while it's my job (if writing unpaid movie reviews on a blog constitutes a job) as a critic to dig a little deeper than that initial surface reaction, as an audience member I enjoyed AMERICAN HUSTLE more than a number of films this year that were arguably “better”, so I can't with a straight face say this isn't a good movie. It's just not as good as it thinks it is. 3 out of 4 stars. Definitely an actor's film, with some great moments and terrific performances within an uneven story backed by a killer 70's soundtrack. I'm easily entertained so I usually don't ding a movie with good production value. My wife on the other hand is very critical. She actually really enjoyed this movie. I think the cast was amazing, story was well done. When I see long movies like this I always look for parts that could have been cut out as they weren't relevant to the story, but I didn't have that issue here.